Or call it Achar (Hindi), Urga (Tamil), Upinkai (Kannada) or Uragai (Telugu). Rich or poor, villager or city slicker, young or old, North Indian or South Indian, these hot accompaniments are a sine qua non of any Indian meal. They go well with rice (particularly yogurt rice) as well as roti. And of course as every Indian knows, they come in so many different varieties – mango, lime, ginger, green chili, red chili, gooseberry, mixed vegetable, carrot and so on. But to discerning gourmands like ourselves, most bottled pickles are a pale imitation of what the family in Andhra Pradesh ships out to us at frequent intervals. 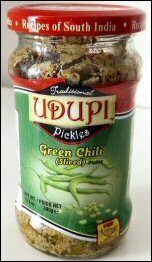 Recently, we stumbled across the Udupi Green Chili pickle at an Indian grocery store in the U.S. Since it was on sale for $1.29, we picked up. Boy, did we hit the jackpot. The Udupi Green Chili pickle is just delicious. Hot but not obscenely hot, slightly tangy but not too sour, the Udupi Green Chili pickle is simply awesome. We tried it with Yogurt rice, Idli, Masala Dosa and Chapati – and each time we had no complaints. We tried the Udupi Ginger pickle too but the Green Chili pickle was far more enticing to our tastebuds. The ingredients listed on the side of the Udupi Green Chili pickle include green chilies, corn oil, salt, lime juice, garlic, mustard, fenugreek, acetic acid, turmeric and sodium benzoate. One Response to "Udupi Green Chili Pickles – O la la la"
Was on the fence…will buy tonight!